In doing so, we don’t want to promise all the answers. There are no simple solutions to never-ending tasks like leadership, working with others and human interaction in general. Our writers are following the foundational belief of the SmartBrief on Leadership newsletter (please sign up! ).– you don’t have to read us to stay current in your field, but we want you to want to read us to make yourself better and help others be better. I’ve done this recap for several years now. For reference, here’s last year’s and 2015’s. For the first time, Arte Nathan’s 2011 post “7 ways to manage employees who are represented by a union” didn’t make the top 10. It was still in the top 20, proving the power of his article and also, I suppose, the perpetual worry about unionization. For the first time since 2014, Joel Garfinkle doesn’t have the most popular post of the year, being succeed by LaRae Quy. In fact, Quy has the top three posts in terms of pageviews and four of the top 10. As always, big pageview numbers are great, and reflect well on the author, but there are a lot of variables. Maybe I wrote a bad headline in the Leadership newsletter and so a great post didn’t get the recognition it should have. Maybe the post was published right before a holiday weekend. This list is reflective of two key things: that the writers offered compelling prose and arguments that struck a nerve, and I didn’t mess it up! 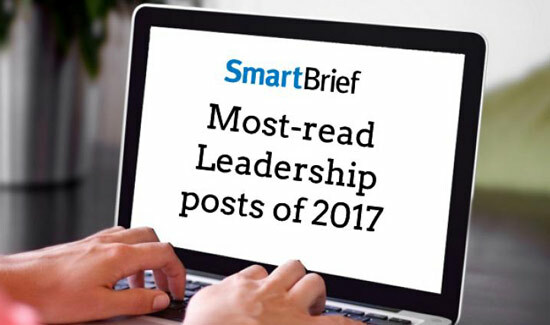 In our year-end roundup at the SmartBrief on Leadership email, I noted that many of the most popular items there reflected tension, frustration or pessimism among that specific readership. I don’t know that that is the case here. Certainly, the popularity of resilience and leadership self-development among these posts can reflect a feeling of being under siege, but it can also simply be that our readership is looking to take charge of their lives and careers. That is great news — and it’s that type of never-ending task that SmartBrief on Leadership specializes in. We all need encouragement and ideas, and sometimes you just need to hear a concept told through a certain story for it to inspire you to action. Specific to this most-read list, I encourage contributors to hone in on a topic. There are endless articles about “5 ways to…” that are mostly platitudes. Yes, of course, we should communicate more and show empathy and hold better meetings and eliminate distractions. But how? Why this way or that way? Resilience, for instance, can be a buzzword if mentioned only briefly, but it acquires a deeper meaning when you spend 1,000 words unpacking it. Another recent example of digging deep on a topic was last week’s Lead Change post by Mary-Frances Winters on the difficulties with workplace conversations around diversity and inclusion. I’m eternally grateful to get to manage this blog and to have you as readers. I’m also owe an unpayable debt to my regular contributors and the countless guest bloggers (and the PR and publisher folks who work on their behalf). This includes Mike Figliuolo, who for many years has written our weekly reader poll and analysis. If we’ve helped anyone this year, it’s largely because of his efforts and those of all our contributors. If you haven’t read these yet, make sure to set aside some time. You won’t be prescribed solutions, but you might be inspired, influenced or prompted toward discovering your own solution. James daSilva is a senior editor in charge of SmartBrief’s leadership and management content, as well as newsletters for HR executives, wholesale-distributors and manufacturers. Before joining SmartBrief, he was copy desk chief at a daily newspaper in New York. You can find him on Twitter sharing leadership and management insights @SBLeaders.